Daniel Lincoln decided at a very young age he wanted to be a doctor. He always took the hardest classes and didn’t take running seriously. Even after placing seventh at states in cross country his sophomore year, while attending Conway High School, it didn’t motivate him to set any big running goals. He didn’t even run track until his senior year. He was all about hitting the books. In fact, he was so serious about his education he left home to attend the finest boarding school in the state - the Arkansas School of Mathematics and Science. Once there, the guys on the cross country/track team bothered him to join cross country. He agreed to cross country, but not track. “I ran decent that season, nothing great,” says Lincoln. True to his word, he didn’t run track, but agreed to join them again for his senior year cross country season. He tore up the trails winning the state championship. After states the 25 best cross country runners from Arkansas, Kansas and Oklahoma competed at the Tri-State Meet. He won that too. Daniel decided to give track a try. At the Texas Relays he ran a 4:16 mile then the following month capped off his high school running career at states winning both the 1600 and 3200 meter runs. He threw down an exclamation point by anchoring his 3200 meter relay to victory. Daniel accepted a full academic scholarship to the University of Arkansas to pursue his dream of being a doctor. Running was over with, so he thought. However, on a tour of the campus for incoming students Lincoln decided to “stroll” unannounced into legendary track coach John McDonnell’s office. “He pretended to know who I was when I asked if I could walk-on the team,” laughs Lincoln. Coach McDonnell, who led Arkansas to 40 national championships during his tenure, said yes. He’s probably glad he did. Daniel would go on to be a 4-time NCAA champion. He capped off his senior season by winning both the steeplechase and 10,000 at NCAA’s. That double landed him on the cover of Track and Field News. 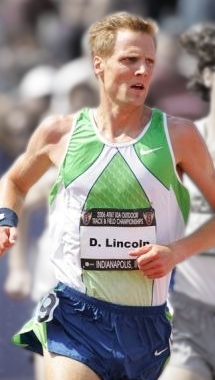 Lincoln continued to improve winning three straight USA steeplechase championships and landing himself on the 2004 Olympic Team. In 2006, at the Golden Gala in Rome, he broke Henry Marsh’s 21 year old American steeplechase record running 8:08.82. He owns three of the ten fastest times ever run by an American.